We were called out to quote for restoring this Quarry tiled living room & hallway for a building contractor in the local area of Wicken. This is a small village on the edge of The Fens near Soham in East Cambridgeshire. The works needed to be completed at short notice as the property was due to be put up for rent, so I agreed to work over two evenings to make sure it was ready for the first tenant. We discussed the cost and the process, and the contractor was happy to go ahead. We can always be flexible with our diary to help out our clients. 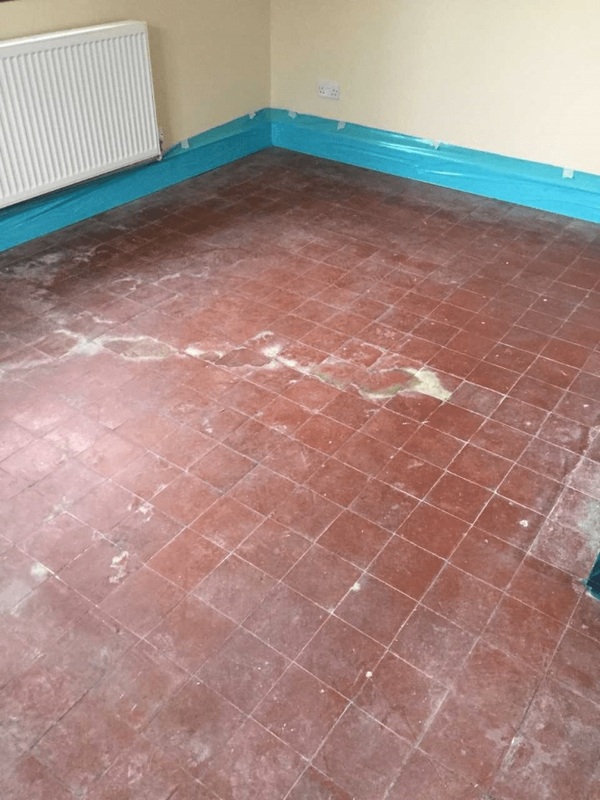 The floor had signs of alkaline salt efflorescence which had left white patches on the tiles, this problem is usually indicative of a damp issue but when I went over to survey the floor, I checked with a damp meter and couldn’t find any evidence of dampness. Clearly something had happened in the past and as the floor dried out it left these white salt deposits on the surface. To remove the salt stains the floor was given an Acid Wash several times with Tile Doctor Grout Clean-Up worked in with a stiff brush pad fitted to a rotary machine. The acid in the product counters and removes the alkaline salts, it also cleans up the tiles of any other mineral deposits such as old grout smears. The floor was then rinsed with water to remove the now soiled solution and then extracted using a wet vacuum. 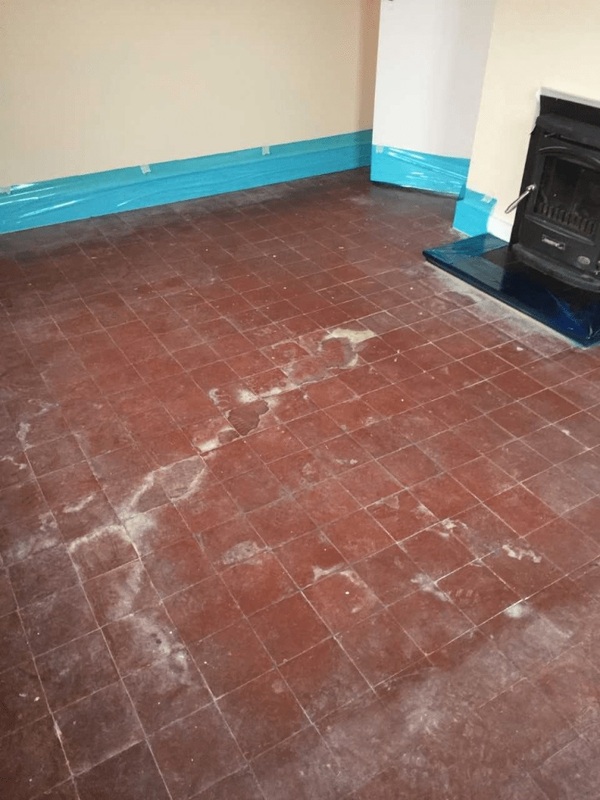 Once I was happy that the salts had been removed, we applied Tile Doctor Remove and Go to strip the quarry tiles of old sealers. This is a non-flammable, multi-purpose stripper which is safe to use on tiles and works best when left to soak into the tile for ten minutes first. This product also draws out ingrained stains and removes heavy grease build-up and any ingrained dirt. We used the rotary machine again fitted with the stiff brush as before to get the floor nice and clean. As before the floor was rinsed with water and the soils extracted using the wet vacuum. The floor was then left to dry overnight in preparation for the sealant to be applied. 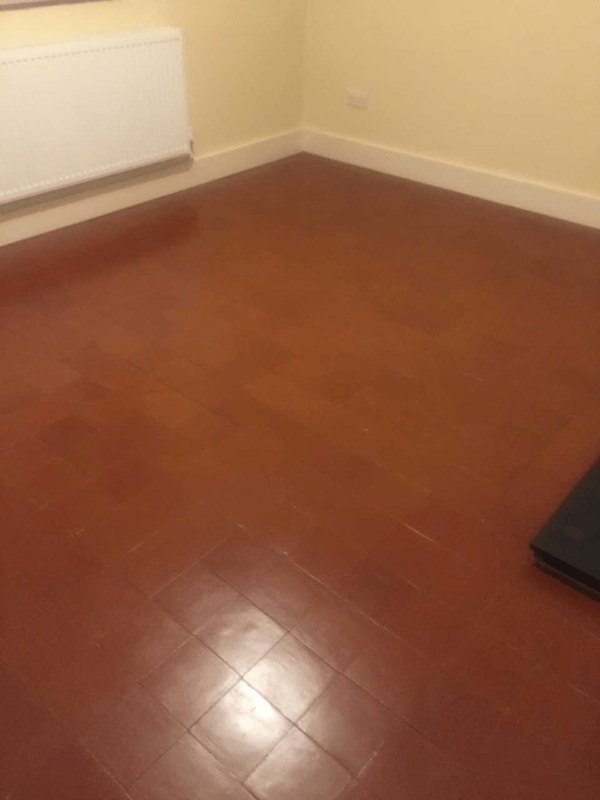 Upon arriving the following evening, the floor was checked again with the damp meter to make sure it was dry, all was well, so it was then sealed with multiple coats of Tile Doctor Seal & Go. This provides both a stain resistant surface seal and a durable low-sheen. The sealer brought back the deep colour in the tile and made a huge difference to the look of the floor. It would also make the floor much easier for the new tenant to maintain going forward. You can see from the pictures the transformation that was achieved. The client was very happy with the completed work and was satisfied he would now be able to rent the property out to his next tenant. 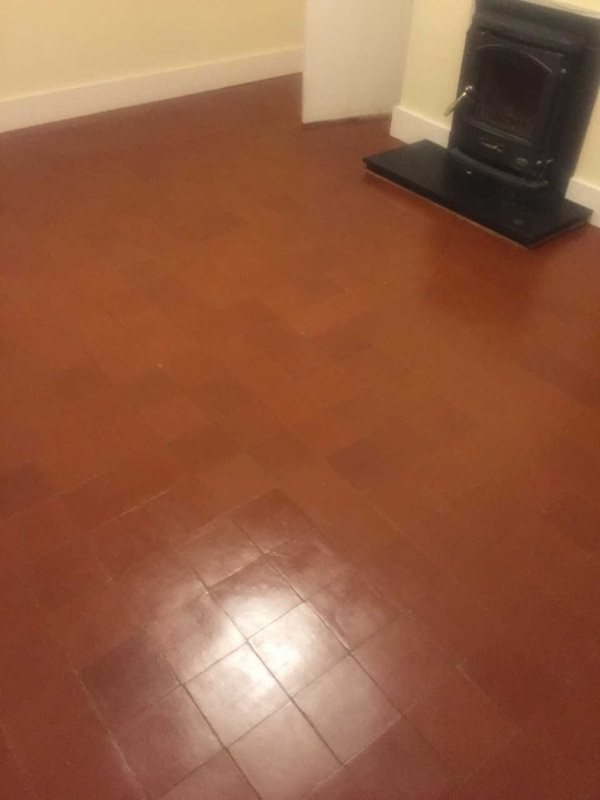 This entry was posted in Acid Wash, cambridge, efflorescence, Hallway Floor, Living Room Floor, Quarry Tiled Floor Cleaning, Salt Stained Tiles, Tile Cleaning Activities, Wicken, Work History by TileProf. Bookmark the permalink.